When I give talks to new veggie gardeners, I tell them that it's important to keep an open mind and try new things, because their gardens may want to grow crops that they are not used to eating. The best example of this is chard, a garden workhorse that will produce armloads of beautiful, mild-flavored greens over a long season, for very little effort. Chard (often called Swiss chard) may be unfamiliar in many kitchens, but it is not a newcomer to gardens. In 1597 botanist John Gerard wrote of growing chard in his garden near London, calling it the "red roman beet" which "brought forth plants of many and variable colors." But gradually multicolored chards became displaced by white-ribbed varieties, which tend to be incredibly productive and more cold tolerant than their colorful kin. By the 1980's, only one seed company – Thompson and Morgan – offered chard in mixed colors as the 'Rainbow' variety. Colorful chards got a huge boost in the late 1990's, when the American Seed Savers Exchange released the 'Five Color Silverbeet' variety. A year later, 'Bright Lights' chard bred by Johnny's Selected Seeds won an All-America Selections Award. In 2000 'Bright Lights' earned an Award of Garden Merit from the Royal Horticultural Society. Today variety selection is even better, and a little seed shopping will turn up individual varieties with ribs that glow in red, yellow, orange, pink or magenta. The first thing you learn when growing chard is that all of the colors are beautiful. 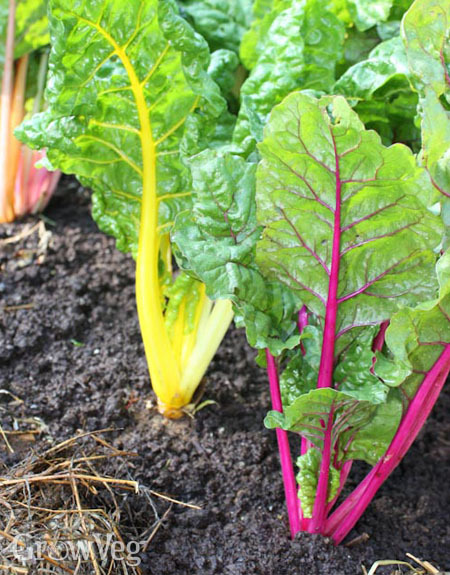 In any color, chard's upright posture and undulating leaves make it a top edible ornamental fit for flower gardens or the veggie garden's most visible edge. 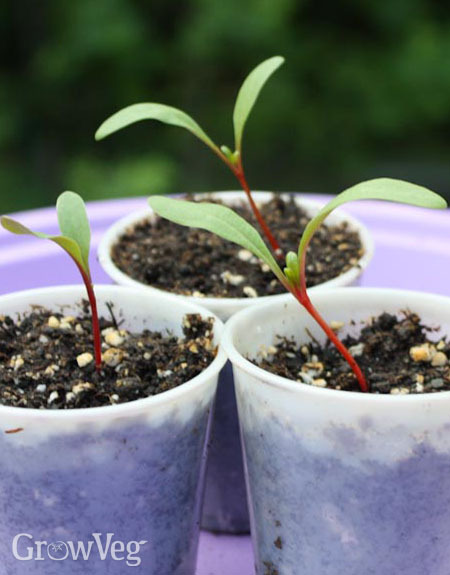 One of the tricks to getting a pleasing stand is to thin seedlings by color – whether you start them in containers or sow seeds directly into prepared beds. Within a week after chard seedlings sprout, you can tell the color of the plants by looking at their basal stems. In my experience, yellow and orange chard seedlings are slightly slower to establish themselves compared to red ones, so I'm careful to leave some of them behind when thinning. I first began growing chard while living in a hot summer climate, and was immediately charmed by its heat tolerance. Chard does not turn bitter in hot weather like other cooking greens tend to do, so it earns its space in the summer garden. The productive plants produce weekly harvests of perfect leaves, plus plenty of rejects for the compost heap. In midsummer I start new chard seedlings for my fall crop so I will have plenty of succulent leaves to blanch and store in the freezer. By late summer, spring-planted chard is often on the verge of exhaustion after producing steadily for two months. Out of curiosity, I dug up the big stump and root of an elderly chard plant for tasting, hoping for something good. Nope. I hope to never be so hungry that I am forced to eat chard roots. As for chard greens, when cooked they have a succulent, buttery texture similar to spinach, and they are well known as one of the most nutritious foods you can eat, loaded with vitamins and antioxidants. In Turkish folk medicine, chard greens have been used to treat diabetes, but there's a catch. People who have a history of developing kidney stones often are advised to avoid eating chard because the leaves contain oxalic acids. Cooking chard greens in lowfat milk removes many of the soluble oxalates, and creamed chard greens are delicious.